On the set of "ZOMBIE", drenched in post-apocalyptic light. Nguyen-Anh first completed a Doctorate in Dental Medicine at the University of Montreal in 2004, then did a residency at the University of Rochester, NY. In 2008, following his passion for the moving image, he went on to graduate from the Film Production program at the prestigious Mel Hoppenheim School of Cinema and co-founded GreenGround Productions, an award-winning production company and CineGround Media, the third largest camera rental and post-production house in Montreal. He has written, directed and produced a number of award winning and internationally acclaimed short films, including THE AKIRA PROJECT, which went viral with over 3.6M views and TEMPLE, which was selected as a Vimeo Staff Pick and Short of the Week. 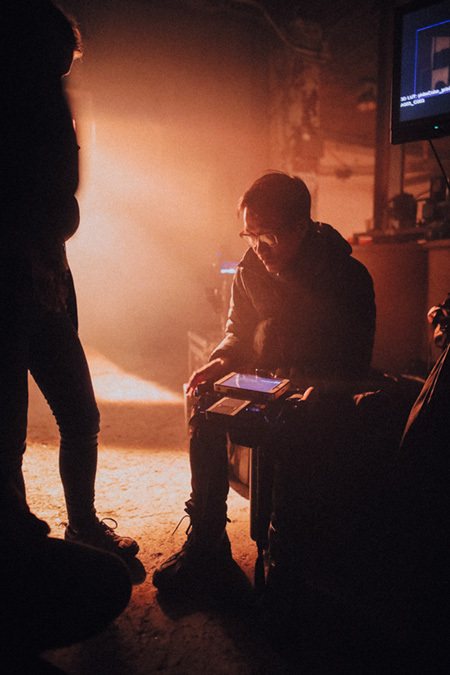 His latest project, HYPERLIGHT premiered online in April 2018 and opened the SCI-FI LONDON International Film Festival. In 2014, he was named by SODEC one of the 5 upcoming filmmakers in Quebec and was part of the first SODEC_LAB delegation at the Cannes Film Festival. His passion for film has always been rooted in intelligent and exciting science-fiction ; AKIRA and BLADE RUNNER were both extremely influential in shaping his present and future work. He is a brand ambassador for Blackmagic Design and Manfrotto and is represented by Ground Control LA. He recently founded Second Tomorrow Studios, a film production house dedicated to Science-Fiction where he is currently developing his first feature film, TEMPLE, supported by Telefilm Canada and a number of private partners. Nguyen-Anh also teaches the art of Indie Filmmaking on SKILLSHARE. Click below to join and get 2 months of premium classes for free.